The Conditions of Contract prepared by FIDIC are used extensively as the standard contract of choice in international construction and civil engineering projects. Engineers working on these projects need to be aware of these contracts, but as the forms are complex it can be difficult to draw together all the sub-clauses relating to a particular issue. 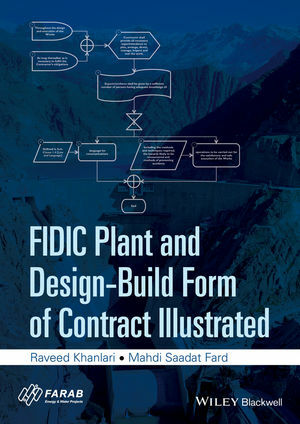 The FIDIC Plant and Design-Build Forms of Contract Illustrated crystallizes the requirements of the FIDIC P&DB contract into a range of simple to follow flow charts, providing a clear and concise way to rapidly assimilate the requirements of each clause. The relationship between the various clauses in the contract, the concepts, process methods and actors involved in each sub-clause are all easily seen, and key issues around each topic (such as periods allowed, notices, etc) are all documented. In addition, related sub-clauses and/or important additional documents are linked so that the reader has a full understanding of the wider implications of each clause. Raveed Khanlari drafts, modifies and negotiates contracts on behalf of Farab Co., both from the view point of the contractor and employer, for projects that Farab is developing or maintaining. Dr Mahdi Saadat Fard is Contract and Financing Manager, with Farab Co., with over 10 years of experience in power plant construction in Iran, Kenya, Sri Lanka, Iraq and Tajikistan, both from contractor and employer's side.